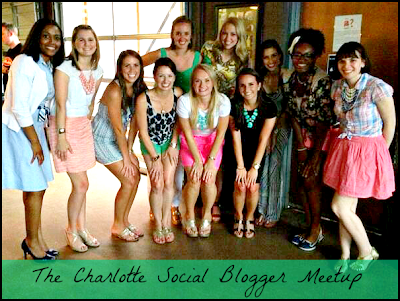 Yesterday, I had the opportunity to meet up with some fabulous bloggers in the Charlotte area. It's always fun to be around other bloggers. I feel like I can speak openly and candidly amongst people who all speak the same language as me. It's so refreshing to be able to talk SEO, webmaster tools and social media tactics without people's eyes glazing over (yes James, I'm talking about you). The group I linked up with is called The Charlotte Social. This group was started by the lovely Bri of Just Bri as an effort to bring bloggers in the Queen City together. Suffice it to say, I think she's succeeded in creating a nice little community of bloggers who are interested in meeting each other and getting out and experiencing new things. Yesterday we met up at the NoDa Brewery in the North Davidson district. If you're familiar with that area of town, then you know that we affectionately refer to it as NoDa. 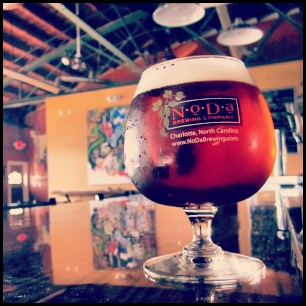 There, nestled in the middle of old brick buildings and art galleries, sits the NoDa Brewing company. Having grown up in Germany, I've visited my share of Breweries, however, this was the first one I've gone to in Charlotte. It was a great experience. I was a bit bummed that we didn't get to take the tour, but that was our fault since we showed up so late. The atmosphere was really chill. I loved the fact that people felt so comfortable that they brought their dogs in with them. The beer was delicious. I only had one because I had to drive myself home and I am a notoriously terrible drinker (seriously guys, alcohol tolerance of a three year old child). I tried the NoDajito; a Belgian Wit mixed with a little lime and mint. Definitely a perfect beer to unwind with after a long summer day. The Director of Community Optimism (how awesome of a job would that be!) was sweet. He came over and introduced himself to us, which can probably be an incredibly daunting experience--imagine being surrounded by a bunch of giggling ladies who all have the power of the internets at their freshly manicured fingertips. What a brave, brave man. For dinner, we hit up The Tin Kitchen; a gourmet food truck that rides around Charlotte, dispersing tacoy-goodness. I had the Brooks Buffalo Cauliflower Tacos, and they were yummy. To be honest, I was a bit nervous going in. After all I was born in Philly; a city notorious for their super unhealthy, yet irresistible food trucks. However, the Tin Kitchen surprised me. They have a unique menu that caters to those of us who are trying to escape the typical overcooked hotdogs and sodium saturated french fries. Definitely a win. Overall, I'd say this meetup was a raging success. Good beer, good food and good conversation. Definitely my kind of blogger night out. So if you live in the Charlotte area, be sure to check us out at The Charlotte Social. Every month we'll be getting together and trying out local restaurants, shops and activities and giving them a little social media love. This looks AWESOME! Glad you had fun! Aw!! I wish I lived closer to be considered a "charlotte" blogger!! I organized something similar up here a couple of weeks ago and it was awesome. You're so right.. it's great to get face to face with people who "get it"! 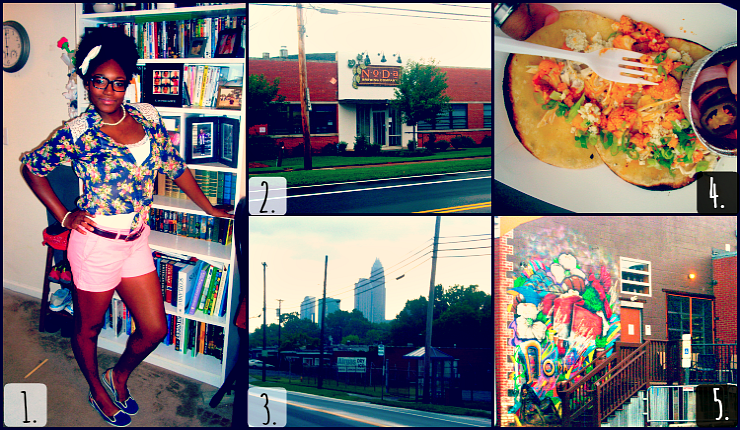 Kristen, I now dub then an honorary Charlotte blogger ;) Mi ciudad es tu ciudad! I absolutely loved meeting you last night! I'm so glad you came and I can't wait to catch up and talk all things "blog" again soon! Thanks also for the pinterest tip! It was great meeting you too. So happy I stumbled upon that tweet :) Looking forward to many many more meetups in the future. I can't wait until there is a blogger meet-up in my area! I would love to get together with other bloggers and share thoughts and creative ideas! It seems like you had a great time, and your outfit was lovely!! Thank you :) We all had a blast! You should check out meetup.com. I've linked up with a TON of local bloggers this way. And thanks for the compliment on the outfit. I'm seriously fashion challenged, but just happened to be in Old Navy the other day and liked what I was seeing. P.S. The shorts are still on sale for $10 a pair! Great photos from last night! It was nice meeting you! I can't wait for the next one. Agreed! We should do a blogger football meetup. Maybe we could manage to persuade the Panthers to let us interview some of the players??? Jealous!! It looks like you had a great time!! Love meeting other bloggers!! We had an awesome time. You should checkout meetup.com. I've found three other local blogging groups. It's a good way to branch out, network and meet new friends! Looks like you had an amazing time! And that beer sounds amazing! This place is stunning. The architecture is beautiful and the decoration is spectacular. Environment at venues in houston was transparent and resonant and warm and immediate. I loved this place and my experience here was very exciting.